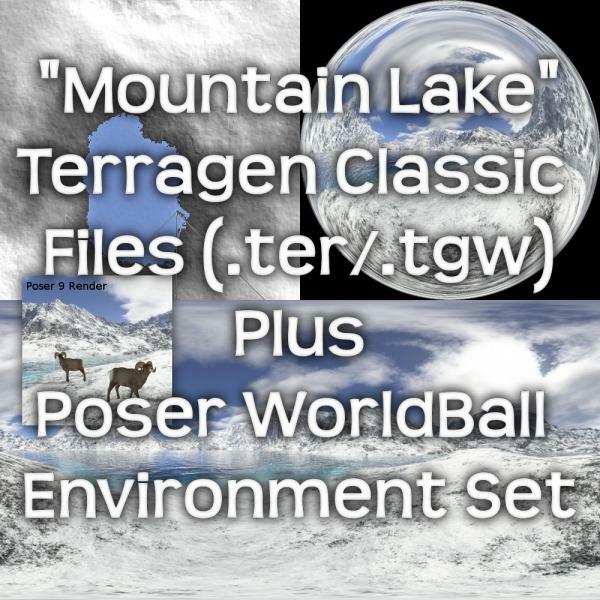 For Terragen Classic: A 'Mountain Lake.tgw' world file and 'Mountain Lake.ter' terrain file. For Poser: a new environment set for the free Poser WorldBall and DAZ Studio WorldBall. See the readme - it contains a databloack that you need to cut-and-paste into your 'WorldBallData.txt' file. jgkane (6 years ago) Inappropriate? Just uploaded version 2 - this contains a reflection map, so it can also be used with the DAZ Studio version of the WorldBall.